This Sicilian sweet and sour rabbit recipe (coniglio alla stimpirata in Italian) is enjoyed across the island, often served at room temperature when the weather’s particularly warm. The vinegar and sugar dressing adds an incredible amount of flavour to the rabbit – although you can swap this out for chicken or fish if you like. 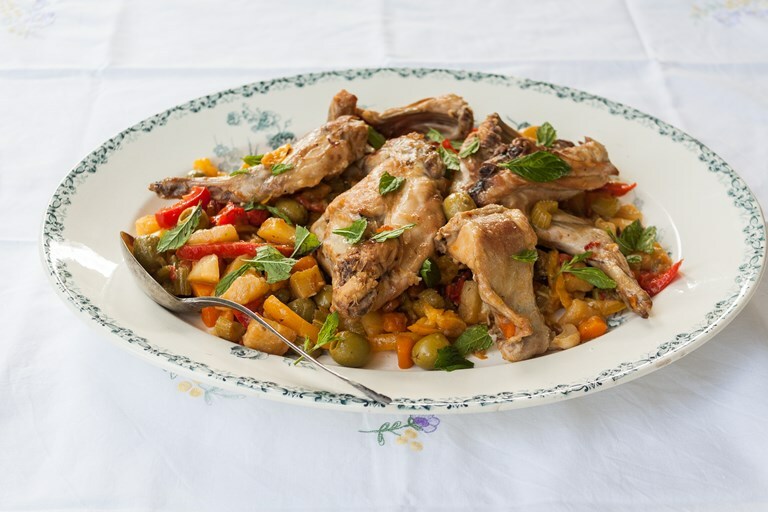 Coniglio alla stimpirata is a sweet and sour dish whose popularity reaches all corners of Sicily. Its distinctive flavour results from the combination of vinegar and fresh herbs, which, together, create an intense cocktail that is at once fresh and pleasantly pungent, and which is best enjoyed at room temperature. Rabbit is the most common meat to cook alla stimpirata –– from stemperare, which means to temper or to tone down. However, this same recipe works well with chicken or white fish, too. As for the vegetables, you can add or remove as you please. For example, courgettes can be added instead of peppers, while the potatoes could be left out to make the dish a tad lighter.